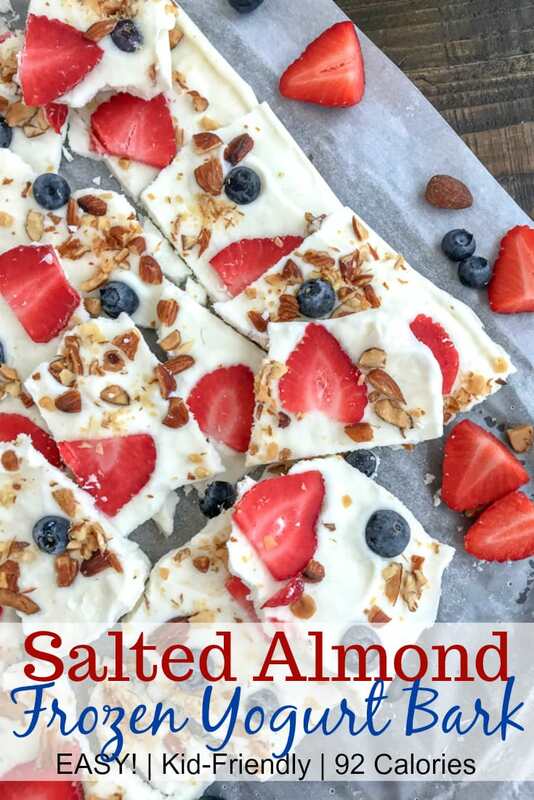 Looking to curb your sweet tooth with something healthy? 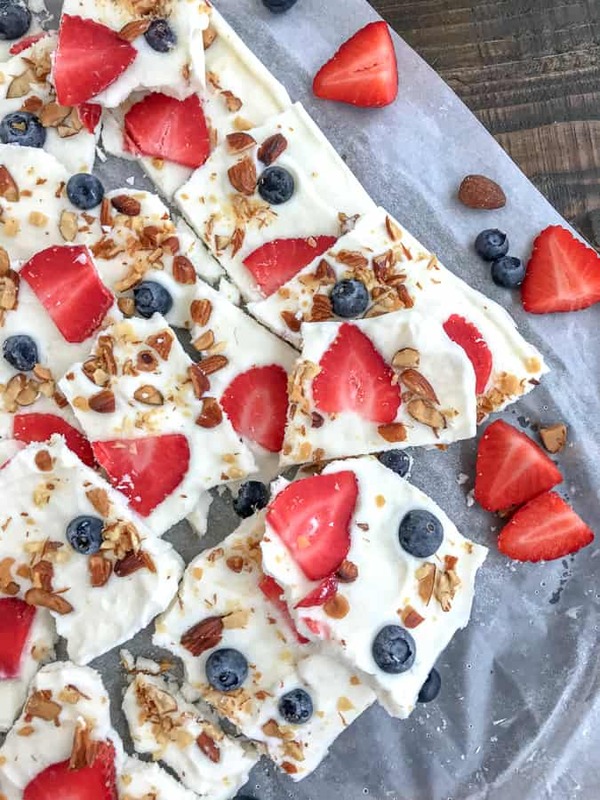 Then this Salted Almond Frozen Yogurt Bark with Berries recipe is for you! Easy to make, requires very little effort or dishes, and is kid-friendly! Only 92 calories per serving! 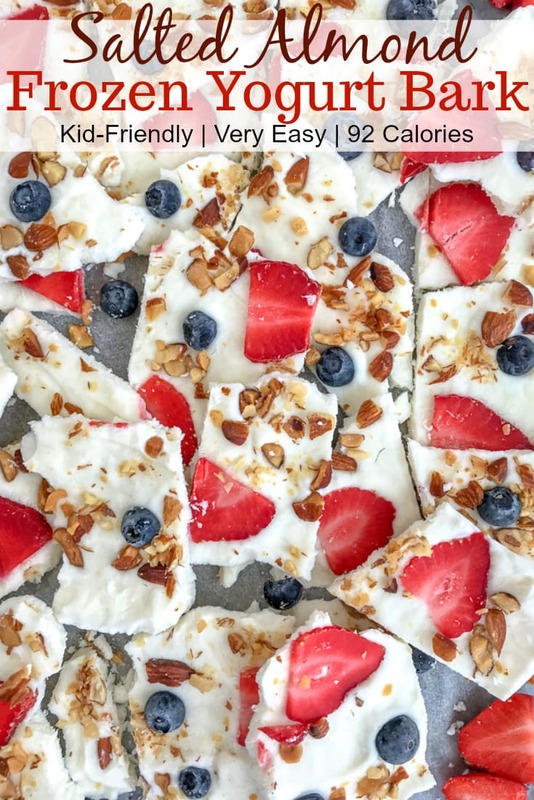 Whether you’re looking to make a snack for your little ones or to find something to feed your sugar fix, you will love this recipe. 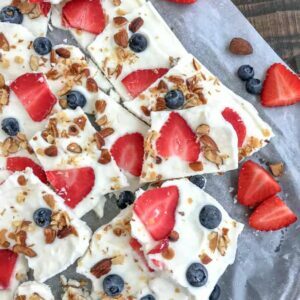 It’s very easy to make, coming together in one mixing bowl and then hardening on a sheet pan – all with ingredients I bet you already have in your kitchen! Plain greek yogurt or any flavor you prefer! Don’t have some of the ingredients listed? That’s ok! Use the fruit you do have on hand, nuts of choice or add your favorite granola. Get creative and add whatever you would put into a yogurt bowl! The options are truly endless. Get creative, use what you have on hand, and let your little ones help you with this one! It’s a fun and easy recipe for them to be involved in. What I love about this combination is the sweetness from the yogurt and berries with a hint of salt from the roasted almonds. It not only hits the sweet tooth, but also a little extra. So if you have similar taste buds, then I do recommend trying it this way. Remember to use lightly salted almonds rather than regular roasted. I never buy regular roasted as they contain too much salt for my liking. I have also tried this with crushed pecans when I haven’t had almonds. It is delicious. In a mixing bowl, combine plain greek yogurt, vanilla extract, and honey. Mix well. Layer a 10″ x 15″ baking sheet with parchment paper. Spread the yogurt onto the parchment paper into an even layer. 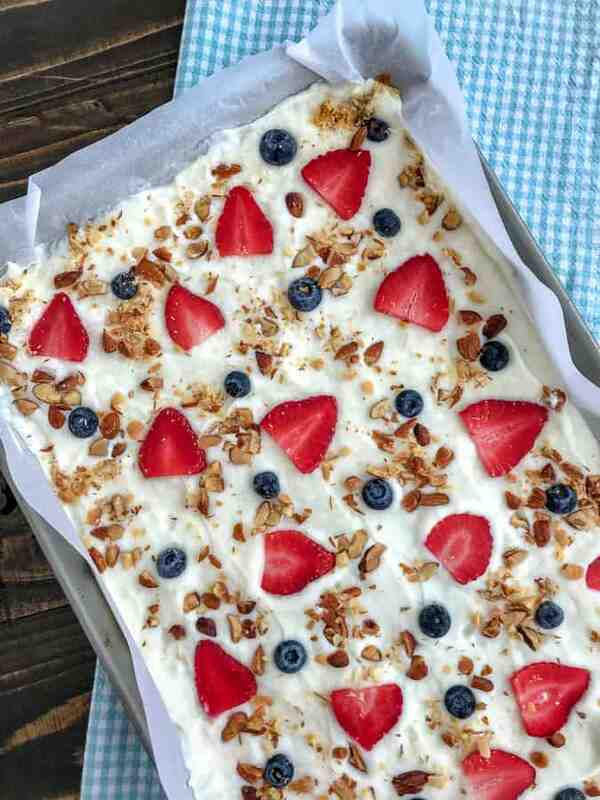 Top with berries and crushed almonds. Freeze, break into pieces and indulge! 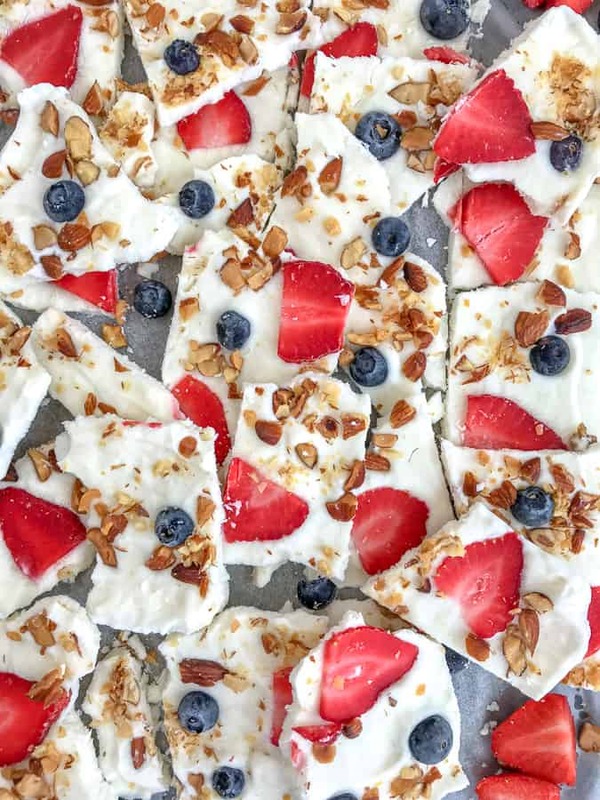 If you don’t own a small sheet pan, line a rimmed baking dish (of similar size 10″ x 15″) with parchment paper and add the yogurt and toppings to freeze. Make sure that you have a smooth, even layer from edge to edge so that it thaws evenly – easier to eat, especially for kiddos! You don’t want it to thaw too quickly, so the thicker – the better! Allow to freeze for a minimum of 3 hours. Make the night before and enjoy for breakfast or in the morning and enjoy as a midday snack. 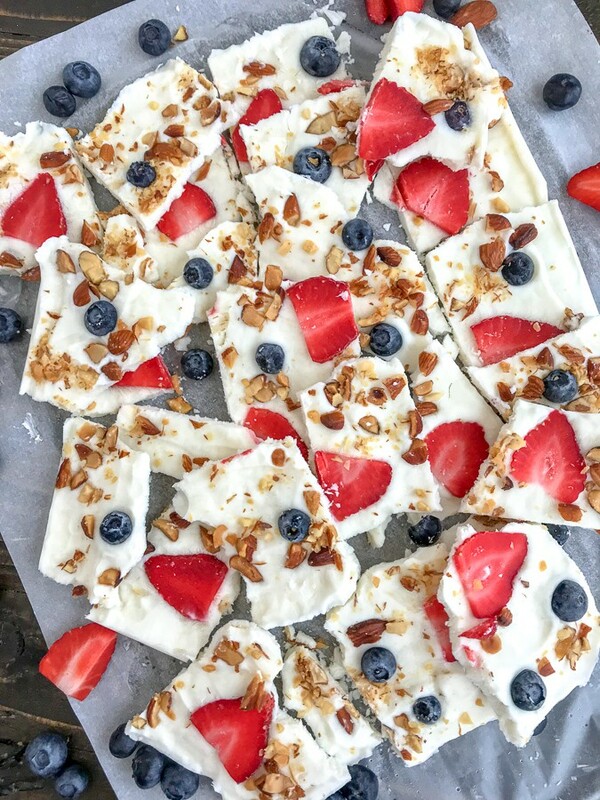 Super simple and delicious Froyo Bark! 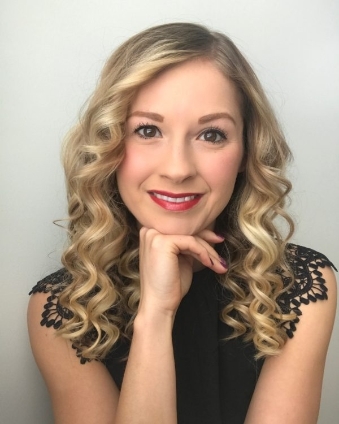 Great way to curb those sugar cravings - in a healthy way! Sweet yet salted flavor that even your kiddos will love! Line a 10" x 15" baking sheet with parchment paper, making sure the paper is larger than the sheet pan to create a lip up the edges. In a medium mixing bowl, combine yogurt with vanilla extract and honey. Spread the yogurt onto the baking sheet to create a smooth, even layer. Use the back of a spoon. Add fruit and crushed almonds. Freeze a minimum of 3-4 hours. Must be frozen solid. Slice into 9 pieces and enjoy! If it breaks apart - that's ok! Store leftovers in a freezer-friendly bag or container. 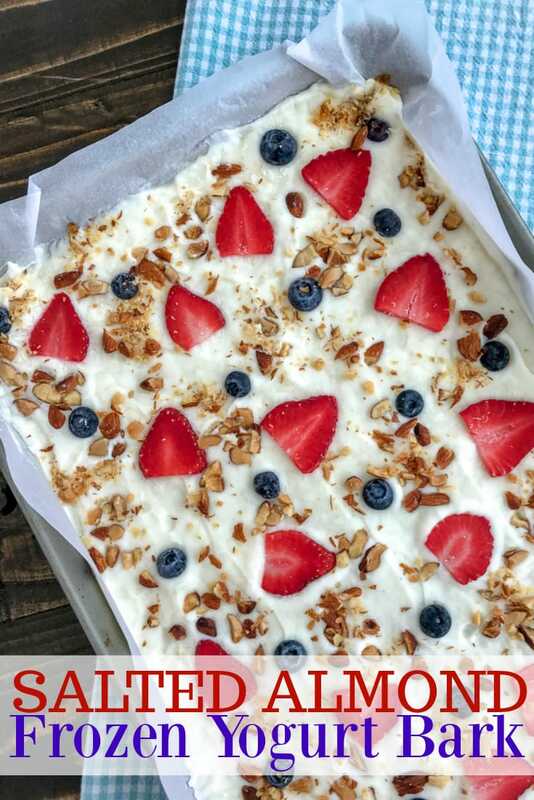 If you don't own a small sheet pan, line a rimmed baking dish (of similar size 10" x 15") with parchment paper and add the yogurt and toppings to freeze. Make sure that you have a smooth, even layer from edge to edge so that it thaws evenly - easier to eat, especially for kiddos! Do you think You could add a protein powder to incRease the amt of protein? Maybe lower the sweetner depEnding On the sweEtness of the protein powder?